Another exciting first for me this month as I had 4 projects published in the Kaisercraft Workshop magazine and today I am sharing the first of them. You can also see details on the Kaisercraft website here and link to the magazine here. This banner would be perfect for a party or even just to decorate a room. The colors are so bright and these robots are just so cool! To get started, paint all edges of the pennants album with two coats of red paint. Cut contrasting triangles from patterned papers. Glue the larger triangle to the album page and then use dimensional tape to adhere the smaller one on top for added dimension. Hand or die-cut (I used this die)cogs from the patterned paper and then use smaller circles of paper to back them with a contrasting color. Find the robots from the collectables pack and use dimensional tape to mount them, tucking them behind the cogs. Use large alphas to spell out the name you would like. 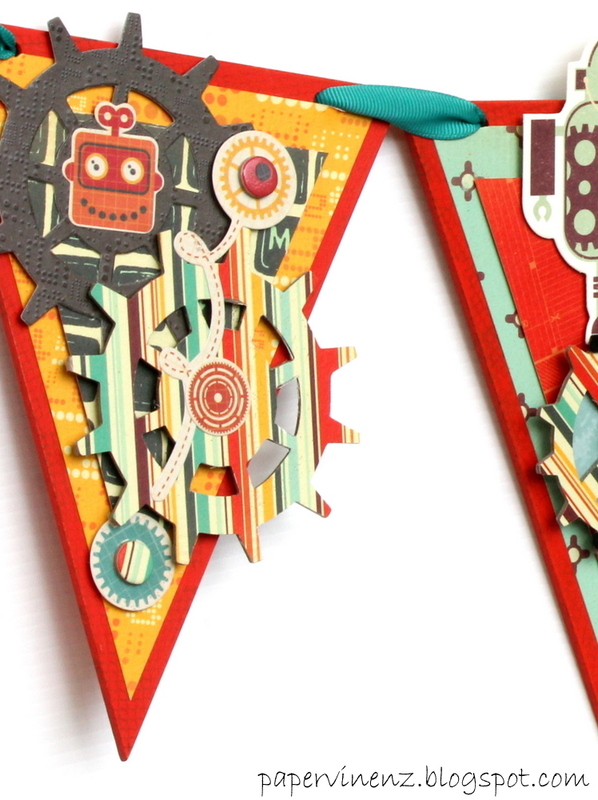 Use additional items from the collectables pack as well as more die-cut cogs to decorate the first pennant if desired. Thread a ribbon through the holes of the album for easy hanging. Please not that the contest previously detailed here has closed. You can see who won here. 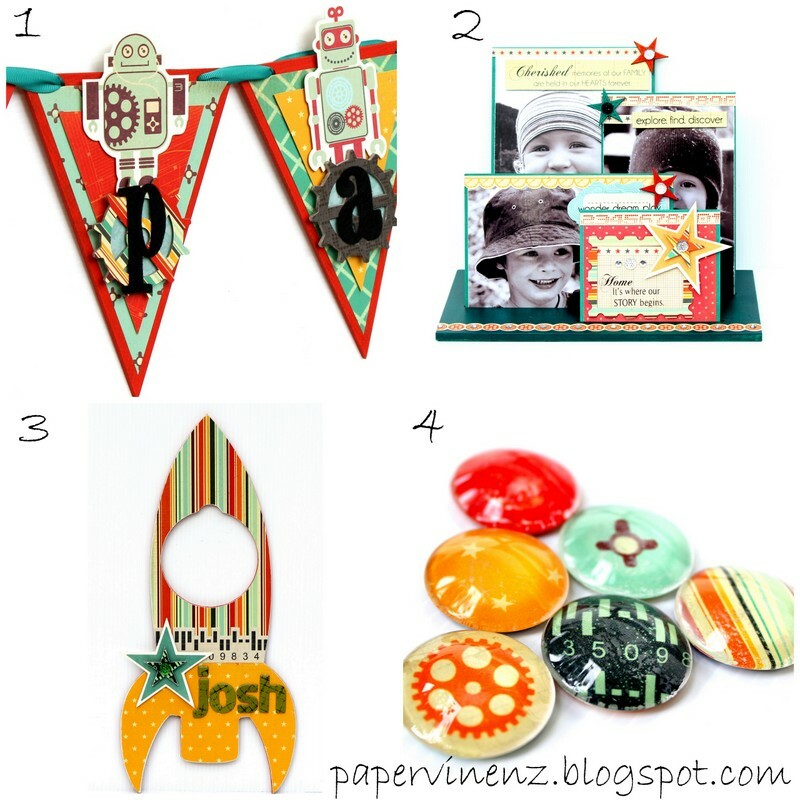 Echo Park Blog Hop Winner! This is really cool! Love the colors in the paper and how you did the ribbon! I LOVE the colors in that collection. I just got a few of the brightest ones and will be mixing them up into everything! LOVE the banner- the patterns are so cool together!!! What a great banner. My two year old daughter is obsessed with robots so she would love this. Will have to see if my LSS carries this line. I'm about to add a little boy to our family& boy do these robots fit right in to boys life! FUN! Love this robot themed design! My boy is definitely more robot than team sports, so it really would be a great one for him! Thanks so much for sharing! That is one of the coolest banners I have seen. Some little guy (or girl) will be very lucky to have it! Lowri the banner is fabulous, it looks so good in this range. Congrats again on the Kaiser feature. Super fun and bright….awesome banner! this banner is beautiful!! choice of colors is perfect and I love also the choice of shapes!!!! What a great line for boys and I just love the banner you have created with it! Thanks so much for the chance to win! Love all the little details; sprockets, buttons, and those robots are adorable! This is just way too cute!!! I must get my hands on this collection!! Thanks for the great idea! I happen to have a banner mini album–I should make a banner for my nephew! Been following since I saw your 52 Reasons I Love You idea, and I love this banner! The colour is great. wow what an imagination. Would love to make decorations for our little nephews rooms. Great idea for a boy's room. I've been a follower of your blog for quite some time. I always find inspiration! I love this collections for technology projects! i love your blog,i have subscribed for a while now. the whole robot theme is truly gorgeous, the colours, shapes ans that super cool banner. love it. I love seeing the awesome projects you post on your blog that I follow through google reader. This is so cute and I love these little robots!! Blog follower- I must make a banner like this for my cousins. THey would think this is cool. This banner is ADORABLE!! I think I've got to get ahold of this paper and do my son's 3rd birthday decos with it in a few months!! Thanks! I have been noticing more and more how popular banners are becoming and I can see why, especially with how cute this one turned out. Of course I mean cute in a "boyish" way!! Great job! My kids love technology and we are having a robot party soon. That banner would go so great with what we have already planned. Love it. Love this banner!!! It would be adorable in my son's room!!! Perfect for boys: very nice! Love it! The gears are so cute! Banners seem to be the rage. Love the bright colors. Interesting for the people who like robots..Like me! Loving the robots..My grandsons will love them too..I am a follower and love your work..
Oh, that banner is awesome! So cool!! So cute!!! I loke it – very colorfull!! So fun! I love this banner. 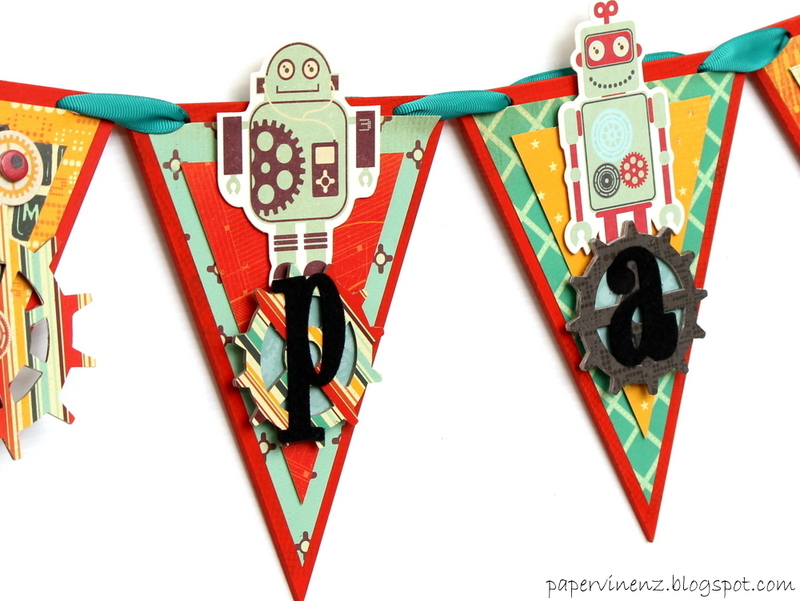 Robots certainly seem to the "in" thing right now and your banner would be super cute for a birthday party! HOW FUN!!! Boy or girl, this would be an awesome banner for a birthday party!! congratulations on getting published! wonderful banner! This would look great on my kids bedroom wall, how many pennants come in the pack? Vary cute banner. Neat collection. My son is a HUGE robot fan and would love this craft! I'm definitely going to do this one with him! Thanks so much for sharing yet another great idea with us! Happy follower. I did a mini version of robot banner for a scrapbook page. Thanks. I want to make a banner for my 4-year old niece's room. She'd love this! I really like this paper asstmt. The cogs really make it come together. Nice work. Super cute banner! I love the ribbon color-really gives a nice pop of color. I've never given much thought to making a banner before, but now I'm thinking I'll need to give it a shot! I just found your website and happy that I did! Love the bright colors. I am a follower, love the banners and the sweet robots. I'm already a follower. Your banner is TOO cute with those adorable robots!